When Dina Gold was a little girl, her grandmother told her stories about the glamorous life she had led in pre-war Berlin and how she dreamed of one day reclaiming the grand building that had housed the family business. Dina’s grandmother died in 1977, leaving behind no documents, not even an address, to help locate the property or prove its ownership. But when the Berlin Wall fell in 1989, Dina had not forgotten her grandmother’s tales and set out to find the truth. And so began her legal struggle — to reclaim the building that had belonged to her family. The six-story office block had been the headquarters of the H. Wolff fur company, one of the most successful Jewish fashion firms in Germany. Built by Dina’s great-grandfather in 1910, it was foreclosed on by the Victoria Insurance Company in 1937. Ownership was transferred to the Deutsche Reichsbahn, Hitler’s railways, that later transported millions of Jews to death camps. Today the Victoria is part of ERGO, a leading German insurance company. Few are aware that the Victoria was once chaired by a lawyer with connections to the top of the Nazi party. The Victoria was also part of a consortium that insured SS-owned workshops using slave labor at Auschwitz and other concentration camps. Dina has delved deep into archives across the world and made shocking discoveries. What she found has repercussions even in today’s Germany. But the story is STILL not over. 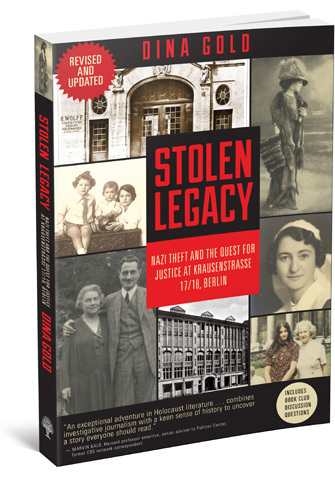 Stolen Legacy is published by the American Bar Association and distributed by National Book Network. Includes book club discussion questions.